Little did Cara Spirazza know how far her love of horses would bring her. Born and raised in Palm Beach County, Spirazza, now 24, recently competed for and won the title of Miss Rodeo Florida 2019. The Miss Rodeo Florida competition was based heavily on horsemanship, as well as appearance, personality, interviews and knowledge of rodeo. These are all things Spirazza honed during her time competing in the Wellington area. Spirazza started riding horses at the age of three and competed in equestrian events throughout her life. As team captain of the University of Central Florida Western Equestrian Team, she helped lead her team to the state championship in 2015. Hospital and school visits, parade participation and community events are just some of the responsibilities of Rodeo Queens. Spirazza is especially compassionate about visiting children at hospitals and often asks rodeo cowboys to join her. Being raised in a medical family, Spirazza grew up with the satisfaction of helping others. She helped raise and train service dogs for disabled veterans through Paws for Liberty and derived great satisfaction from assisting hippo-therapists, especially when it involved treating disabled children. Spirazza enjoyed the time she spent volunteering locally at the Vinceremos Therapeutic Riding Center. Spirazza’s other unique experiences include being in charge of 32 horses at Rocky Springs State Park and giving trail rides, as well as serving as a volunteer firefighter for the Notasulga Volunteer Fire Department when time allows. Her first assignment was to be propelled down an abandoned well shaft to rescue a dog. Spirazza’s innate altruism and love for animals has led her to rescue many animals and nurse them back to health, and she decided early in life that she wanted to become a veterinarian. Spirazza plans on becoming a large animal veterinarian with a focus on equine sports medicine after graduation. 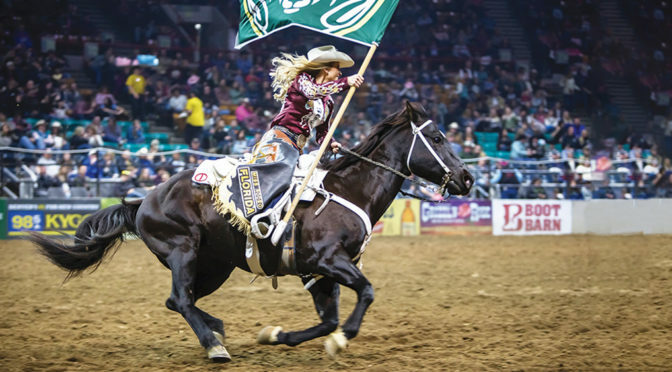 At the end of each year, all of the state rodeo queens compete for the title of Miss Rodeo America in Las Vegas, in conjunction with the National Finals Rodeo. The competition has all the glitz and glamour of the Miss America Pageant, but with a western twist — formal colorful gowns with cowboy boots and hats, dazzling crowns and beautiful belt buckles. You won’t see rodeo queens sing and dance. Their true talent is horsemanship. You can follow her journey on Facebook at Miss Rodeo Florida Association. She’s always willing to help young equestrians and welcomes them to reach out to her.